Laboratoire Remède Translucent UV Coat SPF 30: Slightly tinted, featherweight, with soft-focusing powders for a flawless appearance, this natural finish sheer foundation-meets-sunscreen has completely conquered the lightweight SPF category. 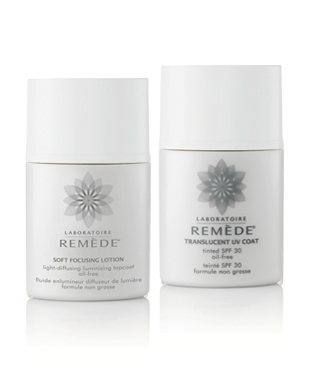 Laboratoire Remède Soft Focusing Lotion This magical, light-diffusing liquid is fast to forgive, and leaves flagging skin looking flawless in a flash. Layer on alone, or mix with foundation.